Examining the Flag, by Jennie Brownscombe, in the early 20th century. In 1999, it was sold at auction for $25,000. 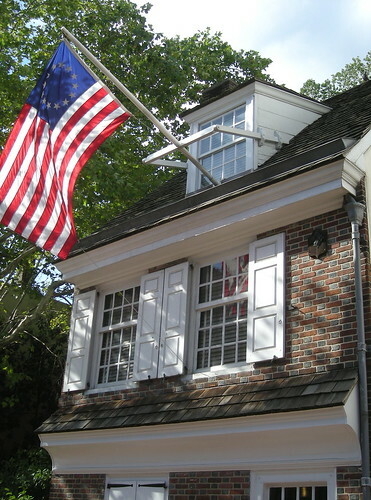 The 13-stars-in-a-circle flag, flying from the Betsy Ross House, 239 Arch Street. The Betsy Ross legend is extremely popular and well-known, and the House, which she and her husbands leased from 1773 to 1785, is among the most visited historic sites in Old City Philadelphia. But did she actually sew the first American flag? Draw your own conclusions. To help you do so, here’s a detailed chronology of the life and times, of the most famous upholsterer in American history. 1752 – January 1 - Betsy Griscom is born in Philadelphia. 1754 – Samuel Griscom – Betsy’s father – assists with the construction of the new Pennsylvania State House – what we know today as Independence Hall. Samuel was married to Rebecca James, also a Quaker. She was the sister of Abel James, a partner in James and Drinker, a thriving firm involved in transatlantic trade - the importation of manufactured goods from Britain, in exchange for raw materials, often tobacco and flax. They move to a house on Arch Street, near 4th, which Samuel had inherited from his father, Andrew. 1773 – November 4 – Betsy and John Ross, the son of an Episcopalian minister from Delaware, are married at Hugg’s Tavern in Gloucester, New Jersey. They elope and marry against the wishes of her family and the Quaker Meeting, due to John not being a Quaker. 1774 – May 24 – Six months later, Betsy is officially expelled from the Quaker Meeting, for marrying John. Accordingly, Betsy becomes an Episcopalian like her husband, and they occupied Pew #12 in Christ Church, as a plaque now commemorates. 1774 - Late - John and Betsy lease the house now known as 239 Arch Street, the Betsy Ross House. They open an upholstery business. She will live there for about a dozen tempestuous years. 1776 – January 21 – John, while serving his duty with the Pennsylvania militia, is killed by an accidental explosion of gunpowder. Betsy is now a widow at 24. 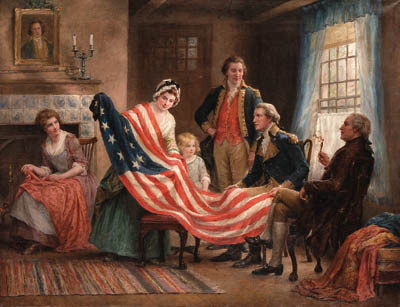 1776 – June – Allegedly (great emphasis), George Washington, Robert Morris, and the deceased John’s uncle, George Ross, meet with Betsy at her house, to provide directions for the creation of an American flag. 1776 – June 5 – Washington leaves Philadelphia, to resume command of the Continental Army in New York. 1776 – July 4 – The Continental Congress adopts Declaration of Independence at the Pennsylvania State House. 1777 – June 14 – The Continental Congress passes Flag Resolution. 1777 – June 15 – The next day, at Gloria Dei Church in Philadelphia, Betsy marries her second husband, Joseph Ashburn. 1777 – September 11 – British General Sir William Howe defeats Washington’s army at Brandywine, Chadds Ford, Chester County. This permits Howe to capture and occupy the young nation’s capital of Philadelphia, hoping to end the Revolution. 1777 – Autumn – 1778 – Winter – Howe opts to retire to winter quarters in Philadelphia, while Washington’s army retreats to nearby Valley Forge, several miles away, in order to keep an eye on Howe’s army. John Claypoole, Betsy’s friend and eventual third husband, is with the army in Valley Forge. She also learns that her husband, Joseph Ashburn, is safe and in hiding in Bucks County. However, Betsy’s house – like nearly all others in the city - is occupied by British soldiers. It is possible that Betsy served as a spy for Washington’s army, as the occupied capital swarmed with double agents. With her husband and many Free/Fighting Quakers whom she considered friends, in the American army, she likely would have done anything she could to promote the American cause. 1778 – June 18 - Largely due to the French decision in February, to enter the war on the side of the Americans, Howe’s army evacuates Philadelphia. 1779 – September 15 – The first of Betsy's seven daughters, Zilla, is born. 1781 – Unspecified – The Philadelphia Free Quakers Meeting is formally organized, with Betsy as a charter member. 1781 – February 25 – Betsy’s second child, Eliza, is born. 1781 – April 4 – John Claypoole captured by the British at sea. 1781 – July 6 – Estimated day that Claypoole arrives at Old Mill Prison, in Plymouth, England. 1782 – March 3 – Ashburn dies in Old Mill, rendering Betsy a widow for the second time, at age 30, with two daughters. 1782 – August – With the war winding down, Claypoole - having been released by the British - returns to Philadelphia, and is the first to tell Betsy of Ashburn’s death. 1783 – May 8 – Betsy, age 31, marries for the third time, as she weds Claypoole at Christ Church. 1785 – Betsy’s third daughter, and first with Claypoole, Clarissa Sidney, is born. 1786 – Betsy’s fourth daughter, Susannah, is born. Betsy and John decide that they need a bigger house, so they move to a house on 2nd Street, near Dock Street. Betsy had spent 12 tumultuous years at the current Betsy Ross House, and she moves out permanently. 1789 – Betsy’s fifth daughter, Rachel, is born. 1792 – Betsy’s sixth daughter, Jane, is born. 1795 – December 20 – Betsy’s seventh and final daughter, Harriet, is born – Betsy is now nearly 45. 1796 – September – Harriet dies at nine months. 1817 – John Claypoole dies at 65. 1834 – The Free Quaker Meeting disbands, as the issues for which it had been created had faded. 1836 – January 30 - Betsy dies at 84. 1855 – Mount Moriah Cemetery opens its doors in southwest Philadelphia, with 54 acres of ground, and accessible via the new trolley. 1856 – The bodies of Betsy Ross and John Claypoole are exhumed from the Free Quaker Burial Ground at 5th and Spruce, and moved six miles to Mount Moriah, where they remain for over a century. 1857 – The Free Quaker Burial Ground at 5th and Spruce is abandoned completely, to make room for urban development. 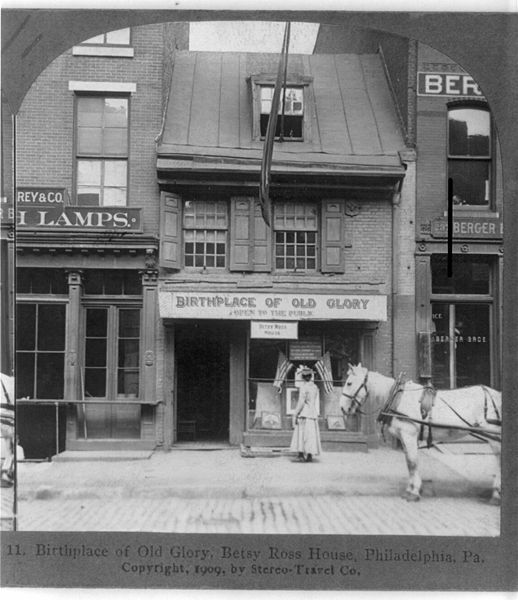 This is how the Betsy Ross House appeared in 1903, during the time of Charles Weisberger's ownership of it - 33 years after the birth of the legend in 1870. (Note: the copyright says 1909, but it is officially listed as 1903 in the file.) Courtesy of the Library of Congress. 1975 – The city of Philadelphia, gearing up for the impending Bicentennial celebration in 1976, exhumes the bodies from Mount Moriah, and returns them to the Betsy Ross House at 239 Arch Street, where they remain today. If you'd like to return to the Betsy Ross House, please click here. If you'd like to leave the Chronology of Betsy Ross and return to the Home Page of Enjoying Philadelphia, please click here.